After I finished my first grocery tote on Friday night, I decided to make another one because I had a huge skein of yarn (Lily Sugar 'n Cream, 400 grams in ecru) and my first tote only used up approximately 1/3 of the skein. This one is going to be a bit bigger than the first. It's coming along but I'm going to have to move on to another type of project after this-- I'm getting really sick of double crocheting without thinking. 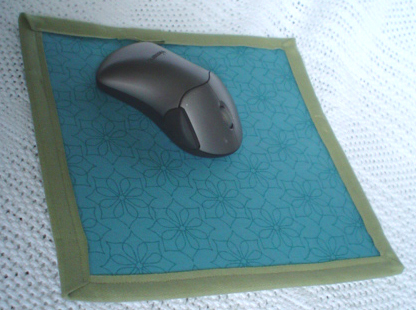 Maybe I'll make the reversible mouse pad (shown above) next. Here's the link to the tutorial on Gruene Tree, via CRAFT.